Anarcho-syndicalism is the theory and practice of reorganising traditional unions, the workplace and society at large. The aim of this is to achieve a self managed society, which is based not on the exploitation of one by the other (whether by boss over worker, man over woman, old over young etc. . .) It will be rather, a society based on the active involvement of all the members in the decision making process and the implementation of these decisions. Importantly, it also means acceptance of responsibility for the consequences of these decisions. This is unlike all present societies where the decision making and responsibility is handed over to the minority in positions of authority. We advocate a society based on the voluntary, active participatory democracy of each for the welfare of all. We advocate unions based on limited tenure of office, recalability of all delegates, delegates to be given a limited co-ordination to cover areas of certain activity. That is, we do not want the election of union bosses who have full executive decision making powers over union affairs. We advocate that all decisions be made by the membership that affect the membership, in fact all decisions. In this form of organisation we see the germ of a liberated society where the people are not dominated by any form of hierarchy: whether it be of a political party, of a religious nature, by a bureaucracy, or one of the `technical experts'. We want a society where the community is in control of the decision making. We base this firmly on the belief that this must be achieved throughout active participation within an international framework. As anarcho-syndicalists we stand opposed to all who would rule on our behalf or in the name of the dictator­ship of the proletariat. There is no room within our movement for the authoritarian ideas of Marxism or the collaborationist ideas of the social democrats. For each according to their ability: to each according to their needs. When you read this pamphlet you will come across three recurring labels or to be more correct statements of ideas, they are Syndicalism, Revolutionary Syndicalism and Anarcho-syndicalism. From the very start I must state that they are not one and the same thing, even though many people including comrades from our own movement will and do use these terms to express the same idea. Syndicalism can be used by almost everybody who believes in the principles of rank and file organised and controlled trade unions. Where the syndicalist stands apart from the British model or for that matter the type of trade unionism that is now practised throughout the world today, is simply that the syndicalist is a true believer in democracy, not for them are the `general Councils', `central committees', `secret board room meetings of the elite groups that control the majority of world trade unions. Likewise the syndicalist will have no truck with the `professional' trade unionist who earn their living from the sweat of their members and who in the British system usually end up sitting in the House of Lords as their payment for years of service to the State and capitalism. In simple terms the syndicalist union is a parallel organ­ised structure, not a vertical structure, the power will always remain in the hands of the members, they are the ones who shall decide when to strike, when to negotiate. Naturally such a union is bound to be much more militant than the collaborationist unions. But other than defending the rights of their members, the syndicalist union, or the syndicalist, had no long term view of the reconstruction of society. It was for this reason that many syndicalists could be, and were members of political parties, especially of the socialist kind. And in fact from time to time certain fascist sects have misused the syndicalist label to further their own perverse ideas. stick firmly to the ideas of revolutionary syndicalism, these are the USI of Italy and the CNT of France. The rest of the International are committed to the ideas of Anarcho-syndicalism and in fact IWA bulletins issued as early as the mid 1930's did carry the label 'anarcho -syndicalist' on them. This has a lot to do with the influence of the Spanish CNT on the International, but also with the valid criticism that the union is but an economic by-product of the capitalist system, born from the needs of our time, and that to preserve it as a system of organisation after the revolution as suggested by the revolutionary syndicalists would imply preserving the system that gave rise to it. The Anarcho-syndicalists accept the union as a weapon in the class war and like the revolutionary syndicalists they try to ensure that the union should be as close as possible to the revolutionary ideals of libertarian communism, that is why both revolutionary syndicalists and anarcho-syndicalists share the same international organisation today. Nevertheless, the revolutionary syndicalist believes that the anarcho­syndicalist is too involved in the political struggle and their close ties with the Anarchist movement will always mean they lack total indepen­dence of action. On the other hand the anarcho-syndicalists believe that the revolutionary syndicalists must `come out of the factories' and more into the community at large if they are to succeed with their revolution. For the anarcho-syndicalists the old catch phrase is still valid that `syndicalism is the means, anarchism is the end', for our movement the work of creating a new society has already begun both within the work-place and the community. For anarcho-syndicalism the revolutionary front is everywhere and that is why the DIRECT ACTION MOVEMENT in Britain have committed themselves to the anarcho-syndicalist cause. In Moscow in the summer of 1920 the newly formed Third International called for the creation of a Red Trade Union International. In December of that year the Syndicalists met in Berlin to decide upon their response to the creation of such an organisation. The Syndicalists drew up several points, the acceptance of these being the condition on which the Syndic­alists would join the Red Trade Union International; "The total independence of the movement from all political parties and the belief that the socialist reconstruction of society could only be carried out by the economic organisations of the producing classes themselves. " The Syndicalists then went to Moscow. The conference for the founding of the Red Trade Union International was a farce. From the very start all business was controlled and conducted by a body called the Central Alliance of Russian Trade Unions, a Bolshevik front. The Syndicalists were a minority, their seven points were ignored. But the work of the Berlin meeting in December 1920 was not wasted. The Syndicalists met again in October 1921 in Dusseldorf and they made preparations for an international convention of all Syndicalist organisations. This took place in December 1922 in Berlin, and is still to this day the greatest gathering of syndicalists, revolutionary syndical­ists and anarcho-syndicalists that has ever taken place. Delegates from the Federation Obrera Regional Argentina, representing 200,000 members; Industrial Workers of the World in Chile, 20,000 members; Union for Syndcialist Propaganda in Denmark, 600; Freie Arbeiter Union in Germany 120,000; Nationaal Arbeids Sekretariat in the Netherlands, 22,500; Union Sindicale Italiana, 500,000; Norsk Syndikalistik Federasjon in Norway, 20,000; Confederacao Geral do Trabalho in Portugal, 150,000; Sveriges Arbetares Centralorganisation in Sweden, 32,000; Comite de Defence Syndicaliste Revolutionaire in France, 100,000; Federation du Batiment from Paris, 32,000; also present were delegates from the Mexican Con­federacion General de Trabajadores, Federation des Jeunesses de la Seine, Russian anarcho-syndicalists. The laigest anarcho-syndicalist organistion, the Confederacion Nacional del Trabajo in Spain was unable to send any delegates due to the fierce class war that was being conducted in that country under the dictatorship of Primo de Rivera. They were later to re-affirm their adherence to the IWA at the Saragossa congress in 1923. The Berlin congress of 1922 adopted the name `International Workingmen's Association' (later to be altered to International Workers Association), they also adopted a `Principles, Aims and Statutes', laying out the principles of Revolutionary Syndicalism. These `Principles and Aims' were amended only slightly over the years, and today still form the basis by which the IWA conducts its struggle for the emancipation of the international working classes. During the 1920's the IWA expanded and many more organisations either joined or entered into regular dialogue with the IWA secretariat. Organisations of Anarcho-syndicalists and syndicalists trade union and propaganda groups were formed in Uruguay, Bulgaria, Poland, Japan, Australia, South Africa, Paraguay, North Africa and in fact any region where industry was developing. The success of the Bolshevik counter-revolution did great harm to the independent workers movement outside Russia, many workers were impressed by the new masters in Moscow and almost every European country saw the birth of a `communist' party in the post First World War years. Never the less the IWA and the syndicalist movement at large were well able to expose the duplicity of the Bolsheviks and hold on to their membership, in some cases even increasing it. What was to be the real danger for syndicalism was not the growth. of authoritarian communism but that of Fascism. The USI in Italy were in 1920 one of the largest syndicalist organ­isations in the world, yet with the coming to power of Mussolini and his fascists they were to become the first of many syndicalist organ­isations to be driven underground and eventually out of existence by the spread of working class nationalism. The FAUD in Germany, the NSV in the Netherlands, (the NAS was by this time a Communist Party front), CGT in Portugal, CDSR in France and many more in Eastern Europe and Latin America were not able to survive the terrible fascist onslaught of the 1930's and 40's. By the time of the outbreak of the Spanish revolution and civil war in 1936, many of the organisations which could have given help to the CNT were themselves fighting for survival. The IWA held its last pre-war congress in Paris in 1938, even then such organisations as the CGT in Portugal could still claim 50,000 members even though their land was under a fascist dictatorship since 1927. The syndicalist union in Poland the ZZZ, a forerunner of the great Solidarnosc, with a membership of 130,000 had applied to join the IWA. put on trial. The editor of the FAUD organ Der Syndikalist, Gerhard Wartenberg was killed in Sachsenhausen concentration camp. Karl Windhoff, delegate to the IWA Madrid Congress of 1931 was driven out of his mind and also died in a Nazi death camp. There were also mass trials of FAUD members held in Wuppertal and Rhenanie, many of these never survived the death camps. In Poland the syndicalist militants of the ZZZ took up arms against the Nazis, as did the Polish Syndicalist Association, in 1944 they even managed to publish an underground paper Syndykalista along with the militants of the ZZZ. Many lost their lives fighting in the Warsaw uprising, where they participated not as isolated individuals but as an organised and collective formation. In Spain after the defeat by Franco and his Nazi and Christian Democratic supporters, the CNT was driven underground but unlike the Communists and their friends who had countries to flee to, the CNT militants had nowhere to go. Many choose to die by their own hand rather than surrender to fascism. Others went to France where they formed an important part of the French resistance to the Nazi invaders, while a small group of CNT militants found themselves in the very strange position of defending Leningrad against German tanks in the Winter of 1941. Many of the CNT comrades became part of the underground movement in Spain in the 1940's and assisted British airmen, Jews, and anti-fascists to escape through Spain back to Britain. These brave comrades were repaid for ther services by the British who handed over their names to Franco when the tide of war had turned in their favour in 1944. By the end of the Second World War, the European syndicalist movement and the IWA was almost destroyed. The CNT was now working as an exile organisation, but some Spanish anarcho­syndicalists were to carry on the struggle against Franco right up to the day he died in 1975. Many of these were to pay with their lives before the fascist firing squads or by slow strangulation, ie, garotting. world present, ALC (Cuba), FFS (Germany), USI (Italy), NSV (Holland), CNTF (France), SAC (Sweden), FORA (Argentina), SWF (Britain), NSF (Norway), FSD (Denmark), BHS (Austria), CNTB (Bulgaria in exile), and the CNT (Interior), CNT (Exterior), FIJL all from Spain, message of support arrived from the FORU (Uruguay). The Portuguese CGT delegation arrived later. But all was not well for the re-emergence of the ideas of anarcho-syndicalism. The Allies who now controlled much of Europe had since the end of the War imposed their form of trade union organisation on the work­forces of the countries they now occupied. In the east, the Russians laid down the law, there was no room for syndicalist unions, or strikes, or workers rights. The `trade unions' in Poland, Czechoslovakia, Hungary, East Germany, Bulgaria etc. were now no different than the hated Nazi labour fronts, there to direct and control the workers on behalf of the state. The situation in Western Europe was not much better, the British Labour government had collaborated with their American bosses in making sure that whatever form of trade unionism arose in the new Germany, that they were making, it would be trade unionism that marched hand in hand with the new bosses and caused no trouble. The situation in Italy was similar, the Americans paid out much money to make sure that there would be no united work force to stand in their way, they could not ban the communist union after all Russia had been their ally, but they could and did make sure there would be no independent workers organisat­ions. The Catholic Church also began to give a helping hand, and in the post war years many Christian Democratic unions began to emerge and very soon began to swell the ranks of the Christian World Federation of Labour, a Trade Union International based in Brussels. Throughout the 1950's the IWA struggled on, but much disagree­ment on how we should deal with the new economic order caused division within the movement. There is little doubt that the hand of the CIA and the Catholic Church was behind some of these moves. In the late 1950's the Swedish organisation the SAC withdrew from the IWA. They were the last functioning trade union within the IWA; for many their loss was considered too great to bear. The future of the International was in doubt, but to those committed to the ideas of anarcho-syndicalism the parting of the SAC was very welcome. For some considerable time the SAC had moved away from the ideas of revolutionary syndicalism and were following a more moderate form of trade unionism. Their organisation had developed a bureaucratic elite, comfortable in their jobs, who were determined not to rock the boat, the Swedish economy was well and Sweden was fast becoming one of the richest societies in the world. The SAC leadership wanted to be a part of this new economic order. They condemned the IWA as being out of touch with reality, too small to have any effect in the present world of labour, so they withdrew. During the 1960's the IWA was at its lowest ebb, all sections within the organisation were devoted to propaganda work, some trade union activists worked in Spain within the existing union structures and helped to keep alive the ideas of anarcho-syndicalism. The Dutch NSV had collapsed, but out of that was created the OVB, a new syndicalist union with 13,000 members, regretfully they choose to remain independent of the IWA. The IWA held many congresses, in Montpellier, 1971, Paris 1976 and again in Paris in 1979 but it was not until the start of the 1980's that the organisation began to flower again. When writing about such things it is not often possible to give an exact date when an idea once again begins to bite into the minds of the people. In the case of the IWA it was the day the Spanish butcher Franco died. After the death of this assassin for the Catholic Church and world capitalism, the CNT in Spain bloomed. One could say almost overnight, from a mere few hundred militants to one hundred and fifty thousand followers by 1977. This was not by chance, this was the result of years of hard work undertaken by the CNT and FIJL (Anarchist Youth) militants. The growth surprised the comrades of the CNT and IWA, it alarmed not only the Spanish state, Church, and bosses but also the social-democratic UGT who for years were hailed by their British and European friends as the only `resistance' to Franco. But the powers that the CNT and IWA were up against have at their disposal almost limitless resources, almost from the moment that the Spanish bosses and their overseas friends realised that the CNT was becoming a real threat again, they planted within the movement persons whose task it was to destroy the union by whatever means possible. While at the same time forces were at work trying to destroy the union from without. After the great 5th Congress of the CNT in Madrid in 1979, moves were made to diffuse the anarcho-syndicalist content of the union. Suggestions were made that the union could only survive with the help of international bodies such as the Christian Democratic Trade Union International and that the union must work within the state laws. Many who swelled its ranks were not anarcho-syndicalists, this was not the problem, the IWA has always been open to all workers who stand independent of the political parties. But the desire of the Trotskyists, Maoists, Catholics etc. to control such a large organisation of workers, led many of these groups into the ranks of the CNT. When they realised that the power of anarcho­syndicalism was as strong as ever within the movement, and that they would never gain control over the union, they set about splitting the CNT. By the time of the 6th Congress in 1983, the 'secession­ists' had formed an `alternative' CNT. But regardless of the struggle within the CNT in Spain and very much influenced by the rebirth of the CNT, the various sections of the IWA had begun to grow themselves. The French section, also known by the initials CNT, were once again an active trade union. Likewise the USI in Italy made a comeback on the industrial scene. The Japanese section of the AIT, soon the change their name to the Workers Solidarity Movement, also began to organise workers. In 1984 in Madrid the IWA held its 17th Congress, and for the first time in almost three decades there were delegates from three unions present. The propaganda groups had also grown, CNT-AIT of Spain, CNT of France, USI of Italy, made up the trade union sections, DAM Britain, ASF Sweden, ASO Denmark, NSF Norway, FAU West Germany, CNT Bulgaria in exile, LWG United States, WSM Japan, FORA Argentina and FORVE Venezuela were the propaganda sections. For the IWA this was the first real step forward in a long time, and for many of the Spanish comrades of the CNT it made them realise that they were not alone in the struggle to achieve the ideas of anarcho-syndicalism. Today the problems that had beset the CNT in the late 1970's are behind them. True the organisation is now much smaller movement than in 1977, but its membership is far more economically aware of the struggle ahead and more committed to the coming fight. The great British Coal Miners Strike 1984/5 has shown to the comrades within the IWA of the supreme importance of international class solidarity and the need to maintain an international network of working class militants. New sections of the International are being established all the time, groups in Australia, Portugal, Uruguay, Brazil and Poland are in regular contact with the IWA. Militants of the great Polish union Solidarnosc and the COB of Bolivia have held discussions with the IWA secretariat to co-ordinate actions of mutual assistance. Information on trans-national companies and class enemies are collected for mutual use by the sections of the International. 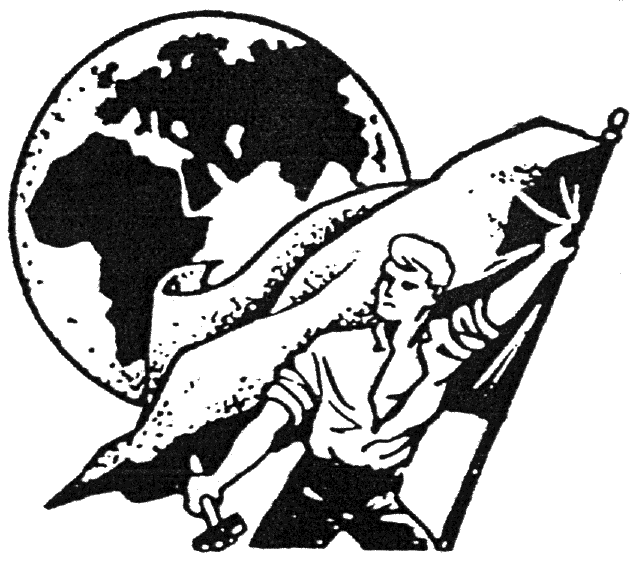 and distribution of information to countries without anarcho-syndicalist groups, the collection of funds to assist striking workers, arranging speaking tours for overseas comrades and striking trade unionists, these are just some of the many tasks undertaken by the IWA and its sections, so that we may live in a world without fear and terror. The present IWA is made up by twelve national or regional sections, in Western Europe, Latin America, North America and Asia. The largest and without doubt the most important of these is the CNT of Spain. Outside official membership of the IWA, there are several regional groups in Australia, Portugal, Uruguay etc. which are in regular contact with the Secretariat of the International, (which is at present based in Madrid) and with neighbouring IWA sections. Here I shall try to give a brief outline of each section of the International as they are organised today. The National Confederation of Labour in Spain (CNT) was founded in 1910. From the very beginning the CNT has had its main strength in the region of Catalonia and in particular in Barcelona, which is Spain's largest industrial city. The history of the movement is one of great hardship and struggle, their role in the Spanish Revolution and Civil War of 1936-1939 is well documented and there is no need to go into it here. At its height the CNT had a membership in excess of two million and was the largest trade union organisation in Spain. During the years of great terror under the dictatorship of the fascist Francisco Franco the CNT was totally suppressed and many of its most active militants were executed. Nonetheless anarcho-syndicalist guerrillas returned to Spain and carried on the struggle against fascism. This type of action which was not always carried out with the approval the National Committee of the CNT (in Exile), did help keep the idea of anarchism alive in Spain. In 1976 after the death of Franco the CNT re-emerged from the twilight and began to rebuild the union movement. At first it was only the die hard militants, who had never ceased to be members of the CNT, who worked tirelessly to reconstruct the union, later in 1978/79 under a wave of social change in Spain the ranks of the CNT swelled to almost 150,000. Unfortunately the vast majority of these were not prepared to work for the ideals of the union, they just wished to be able to show a CNT membership card to prove how `revolutionary' they were. They were no real danger to the CNT or the state. At this same period the CNT was also to see an influx of Catholic, Maoist and Trotskyist pressure groups, each one intent of taking over the union for their own political cause. These people caused much damage to the CNT and in 1979 after the 5th Congress of the union a section broke away under the pretext that they wished to involve themselves in factory council elections. These elections and councils were organised by the state and the majority of the CNT keeping within the traditions of anarcho-syndicalism opposed them. The state was quick to seize upon the split to claim that they could not return the CNT property that had been seized during the Franco years as they did not know to which CNT to return it to. Meanwhile the other unions, UGT in particular received large amounts of money from the state to assist them in their union work. There was little doubt that the Spanish socialist government recognised who the real revolutionary trade unionists were. Today the CNTT which now uses the initials CNT-AIT (Associacion Internacional de los Trabajadores) to distinguish it from the collaborationist union, has a membership of about 30,000. They are organised in the construction, public and private transport, both heavy and light industry, hotels, teaching etc. In fact the union has members in most industries and the organisation has regional committees in every province of Spain with the exception of the Canary Islands. At the 17th Congress of the IWA, the CNT-AIT were recognised as the one and only genuine anarcho-syndicalist trade union in Spain. France was the birth place of syndicalism, it has a long history of revolutionary syndicalist unions. In 1922 three such organisations went to Berlin to attend the 1st Congress of the IWA. The first French syndicalist union the CGT fell into the hands of reaction­ary communists in the years after the end of World War One, but the syndicalists were able to hold onto almost 200,000 members right through the 1920's. During the years leading up to the Second World War the French syndicalist movement organised no less than three congresses of the IWA and provided much assistance to the CNT in Spain during the Civil War. When France was overrun by the Nazis in 1940, all syndicalist unions were forced underground, and many militants were dragged off to the concentration camps and forced labour factories in Germany. After the war France was in much the same position as the rest of Europe. There was very little left of the syndicalist movement. In these post war years the French CNT was really no more than a revolutionary syndicalist propaganda group, but slowly it managed to organise itself once again into a trade union. Even though many who swelled its ranks were themselves former militants of the Spanish CNT, the French union always remained firm to the principles of revolutionary syndicalism and opposed those sections within the IWA, mainly the FORA, which pushed the ideas of anarchism at IWA congresses. The CNT main areas of organisation are in South Western France and the Paris region. The union has worked closely with some small regional independent unions like the Syndicat Autogestionnaire des PTT du Rhone (SAT) and at the 17th Congress of the IWA they revealed plans to merge the two unions. Certain sections within the CNT are opposed to the presence of any propaganda groups within the IWA, but this traditionalist revolutionary syndicalist view point is only held by a short sighted minority. The majority of the CNT membership who are ordinary non-committed workers have until quite recently held back from involvement in the work of the IWA. During the British Coal Miners Strike (1984/5) several locals of the CNT came together with local anarchist groups and Free Thinker groups to collect money for their British comrades. The CNT publish a monthly paper called Le Combat Syndicaliste from Toulouse. The USI was founded in 1912 in Milan, by the end of World War One it had a membership of 500,000. Like the CNT of Spain its early years were times of great social upheaval, leading up to the seizure of state power by the Fascists in 1922. Mainly because the USI were not established long enough, the social and political awareness of their membership was not that well developed and with the coming to power of the Fascists the USI were in no position to fight back. The USI held their last Congress on Italian soil in 1928. During the Second World War, Italy was unique among European countries, it had a large anarchist resistance movement especially in the North, but regardless of this, the USI were in no position to play an active role in the reorganisation of the trade unions at the end of the second world war. It was not until the 1970's that the USI could once again begin to think of organising themselves as a union. They had throughout the 1950's and 60's worked as a small propaganda group and were at all times a part of the IWA. In 1979 they held a national conference in Parma and elected a provisional committee. By 1983 they were able to hold their first national Congress as a trade union and relaunch their paper Lotta di Classe, which is published from Rome. The USI today have locals in Rome, Trieste, Ancona, Milan and several other cities in addition to having groups in every province of Italy. The USI have a long tradition of revolutionary syndicalism and have openly expressed their desire to see the IWA as an International of only revolutionary syndicalists free of the strong anarchist influence and independent of all political groupings. This organisation was founded as the International Workers Association of Japan, in 1983 it changed its name to the WSM. Japan has always had a strong anarchist tradition and some Japanese comrades fought with the CNT militias during the Civil War. But in the 1920's and 30's the movement was suppressed and many comrades killed, as part of the new militarist state plan to make all Japanese think alike. By the end of the Second World War the United States imposed their new imperialism on the Japanese people, and the situation was not to change until the 1960's. The WSM is a new movement which came into being in the late 1970's and first started in the Tokyo area. The National Committee is based in Tokyo which is one of the five regions organised by the movement, the other four are, Saitama, Nagano, Shikoku, and Kansae. The WSM stated at the 17th Congress of the IWA that they were an anarcho-syndicalist organisation, committed to the formation of revolutionary unions and that they were in contact with other revolution­ary union organisations in East Asia. The DAM was formed in Manchester in 1979 and replaced the Syndicalist Workers Federation as the British section of the IWA. The SWF had by that time been reduced to one branch in Manchester. It was that branch which provided the impetus for the creation of the DAM. to their imagination, they chose to stay with the Methodists, who have betrayed them at every turn since. No British section was present at the founding congress of the IWA and only small propaganda groups advocated the ideas of anarcho­syndicalism in the pre-second world war years. After the war the SWF was founded and in 1950 were admitted to the IWA. The SWF attempt­ed to create an open organisation, admitting all who wished to work by syndicalist methods. For a time this seemed to work and the Federation grew in numbers but because it was neither anarcho-syndicalist or revolutionary syndicalist it soon lost its general direction and went into decline. The younger militants who formed the DAM, were well aware of these shortcomings and from the start they declared the DAM should be an anarcho-syndicalist organisation. Today the DAM is organised in three regions, north east, north west and south east England within these regions the movement is based on local groups. The main work of the DAM is in the field of education and prop­aganda, with a fair amount of solidarity work around strikes.and industrial disputes. The movement produces its own paper Direct Action and several groups also produce local newssheets. At the 17th Congress of the IWA the DAM was well represented with as many as twenty five delegates and observers. The FAU was founded in Cologne in 1976, and sees itself more in the mould of the CNT than the old FAUD. The syndicalist movement in Germany has a long history and the Frei Vereinigang deutscher Gewerk­schaften which was the original name of the FAUD was founded in 1897. In the early years just after the first world war the FAUD grew to almost 200,000 members, the level of political and revolutionary aware­ness of the German working classes has never been higher, but time and history were not on their side and by the time of the coming to power by the Nazies in 1933, the FAUD had less than a quarter of its original membership. During the Nazi period all opposition was crushed. The concentration camps were flooded with FAUD, AAUD and AAUD-E (council communists) militants. By the end of the war none of these organisations survived. The 1950's and 1960's were a quiet period, but there was a large influx of labour into Germany, especially from southern Europe. Among these workers came many members of the Spanish CNT, who were to settle in the larger German cities. It was from contact with these comrades that the young German anarcho-syndicalist militants developed their ideas and started to rebuild the movement once again in Germany. The FAU is organised into two sections, north Germany and south Germany, like the DAM in Britain their main field of work is propaganda and education. Because of the immensely bureaucratic nature of German trade unions, (a copy of the British system) it is next to impossible for the FAU to make much headway within the system, likewise the German state law prohibits members of such organisations as the FAU from holding any job in the public sector, ie. railways, teaching, etc. This has made it very difficult for anarcho-syndicalists to organise in the workplace. Nevertheless the FAU have been active in the 35 hour week struggle and similar industrial disputes. They have also been active on the international solidarity front, organising holidays in Germany for the children of striking British coal miners. They publish a regular paper Direkte Aktion from Cologne. The NSF was founded in 1916 as a union of general workers but mostly containing miners and construction workers. The union had many Swedish members, this was due to the fact that after the great Swedish strike of 1909 many Swedes moved to Norway searching for work after they had been blacklisted. In 1919 the Norwegian state mass deported many of these workers, this badly affected the NSF membership, yet the NSF was present at the founding of the IWA in 1922. Through the 1920's and 30's the NSF remained an active syndicalist union and kept in regular contact with those sections especially the FAUD and the ZZZ which were then being crushed. With the occupation of Norway in 1940 by the Nazis the NSF was suppressed. After the war the NSF carried on but more as a propaganda section than a union. The NSF today work within the existing trade union movement, as do all the northern European sections, but in the case of the Norwegian labour movement many of the union locals are quite independent of the central organisation, the LO. This has enabled the NSF to distribute much propaganda and educational material within the national union structure, and under the direction of the NSF a very successful solidarity campaign was undertaken for militants in the dictatorships of Latin America. Likewise the NSF have been deeply involved with the work of the Polish free union Solidarnosc, whose largest support group is in Norway. The NSF publish a regular magazine, Arbeider Solidaritet, which is distributed free to all trade union locals. In 1922 the Union for Syndicalist Propaganda representing 600 comrades was present in Berlin for the 1st Congress of the IWA. The Danish syndicalist movement was always rather small but throughout the years there was always some kind of syndicalist propaganda group active in Denmark. In the 1950's the FSD represented the IWA in Denmark. In the late 1970's a whole new generation of young militants set up the ASO at first in Copenhagen and later setting up other groups around the island of Zealand. The organisation is mainly engaged in the field of propaganda, but they have undertaken some union work, and are involved in organising solidarity meetings for striking workers. Sweden has had since 1910 a syndicalist union, the Sveriges Arbetares Centralorganisation (SAC), which was up until the late 1950's a part of the IWA. Today the SAC is still an active trade union with a membership of about 15,000, but its commitment to the ideas of revolutionary syndicalism (it was never anarcho-syndicalist though it does describe itself as that in its Spanish language publications), is now very weak. are members of the Swedish LO. The ASF was formed as a support group of the IWA in the early 19 80's but in 1984 it was admitted as the Swedish section. They are organised in Stockholm, Goteborg, Lulea and in the industrial areas of the north of Sweden. The FORA is the oldest section of the IWA, founded in 1891, it was from the very start committed to the ideas of libertarian communism. These ideas have often brought it into conflict with the revolutionary syndicalist sections of the IWA, not because the revolutionary syndicalists disagree with the idea of libertarian communism but because they see what they call the political hand of anarchism behind the FORA's thinking. The FORA have never denied this and have remained steadfast to the principles of anarchism. This despite the terrible repression that the movement suffered in Argentina. The history of the FORA is one of great struggle, it is also one of great inspiration for all class war anarchists and anarcho-syndicalists. Their membership at the time of the 1st Congress of the IWA was well over 200,000, they produced two daily papers, one morning, one evening. They were the greatest force in Argentinian labour for almost forty years. As a major union they were broken by the power of the political military in that country, who have been behind all the dictatorships and bloody repressions. It was because of this that the FORA were the continuing advocates of workers militias, much to the annoyance of the revolutionary syndicalists of the IWA. The FORA today is no longer an active trade union, but a propaganda and education section. They still maintain contacts with those few unions that are not either Peronist or Marxist. Though the few comrades of the FORA have all seen better times there is new blood coming into the move­ment and new centres being created outside the traditional base in Buenos Aires. This is a small organisation centred in Caracas, it was founded by CNT exiles after the Civil War in Spain and has been more or less run by these comrades ever since. The trade union situation in Venezuela is such that the two main political parties control all the unions between them. Passing laws forbidding unions to have any international links and suppressing all attempts to form independent unions. The UOV in the 1920's was founded by anarcho-syndicalists, but all militant unionism was crushed by the State, leaving the way open for- the formation of party unions. The FORVE has since its founding taken an active part in all the work of the IWA. They have also played an active role in the international anti­fascist organisation, the SIA (Solidaridad Internacional Antifascista). The Bulgarian anarcho-syndicalist organisation in exile is better known by its French initials CNTB. This organisation was once very active in its home­land before being driven underground by the Marxists, assisted by the Soviet Army in the late 1940's. The Bulgarian anarcho-syndicalist and anarchist movements were well established in that country by the turn of the century. In fact the history of Bulgaria's liberation from the Ottoman Empire is tied very closely to the history of the anarchist movement there. Today there are still comrades of the movement inside the prisons and labour camps of the Marxist dictatorship, many since the early 1950's. The CNTB work is now in the field of propaganda and they have groups in France, Britain, United States, Canada and Australia. The CNTB also maintain contacts inside Bulgaria itself, though this is very dangerous, the Bulgarian Security Police will stop at nothing in their drive to silence the enemies of the state. The death in a London street of one anti-state activist, and the attempted murder of another in Paris is testimony enough to the seriousness of the struggle. The section of the IWA in the United States was reorganised in late 1984. Formerly it was the Libertarian Workers Group based in the New York area but after holding a national conference they decided to expand their organisation and attempt to organise other like minded syndicalists into the movement. The history of syndicalism in North America, is really the history of the Industrial Workers of the World. A general union founded in 1905 in Chicago The American comrades never used the label `syndicalism' but preferred the words `industrial unionist', nonetheless it was the same idea. And the struggle in North America was just as fierce as anywhere else, the great syndicalist folk hero Joe Hill was a militant of the IWW, and an early victim of the Mormon Church. The IWW set about in the years before and after world war one to organ­ise an international, one of these great successes being in Chile. Other sections were set up in South Africa, Australia, Britain and to a lesser extent Sweden. They always stood apart from the IWA, even when their largest organisation the Chilean IWW joined. In the early years this was not a problem but with the decline of the IWA and the IWW, it was absurd to have two 'internation­als'. Anarcho-syndicalist comrades in the United States applied to join the IWA and soon a small section was formed in New York in the late 1970's, this was the LWG. Much useful work has been carried out by this section in the field of propaganda and solidarity work, but the great size of the United States have made it very difficult for them to organise. The IWA still has very friendly relations with the IWW and looks forward to the day when there will exist one regional section comprising of the comrades of the IWW and WSA. The RWG in Australia is just one of the many anarcho-syndicalist propag­anda groups that have developed over the past ten years around the world. Though based in only one city as yet, Sydney, and still awaiting member­ship of the IWA they have been actively engaged in solid international solidarity work, as well as publishing one of the finest English language anarcho-syndicalist papers, Rebel Worker. 1864 Founding of the International Workingmen's Association (First International) in London. 1866 First congress of the IMWA, Geneva (September). 1876 Death of Bakunin (1st July). 1886 Haymarket Martyrs executed (11th November). 1891 FOA founded in Argentina, changed name to FORA in 1901. 1893 NAS founded in the Netherlands. 1895 CGT founded at Limoges, France. 1896 First congress of Peruvian workers organised by local anarchists. 1897 Anarcho-syndicalists help found the FRO in Puerto Rico. 1897 Freie Vereinigang deutscher Gewerkschaften founded in Germany, later changed its name to FAUD in 1920. 1905 FORU founded in Uruguay (March). 1905 IWW founded in Chicago (June). 1906 Anarcho-syndicalists found the Labour Federation of Paraguay. 1906 Federacao Operaria Regional Brasileira founded. 1906 At Amiens the CGT publish the `Charter of Amiens' reaffirming their syndicalist principles. 1906 Formation of the South Russian Group of Anarcho-syndicalists. 1907 Voice of Labour first English language anarcho-syndicalist newspaper launched in London. 1910 Industrial Syndicalist Education League founded in Britain. 1910 SAC founded in Sweden. 1910 CNT founded in Spain (October). 1911 CGT founded in Portugal. 1911 Golos Truda first Russian anarcho-syndicalist paper launched in New York, moved to Petrograd in 1917. 1912 USI founded in Italy. 1913 International Syndicalist Congress held in London. 1916 NSF founded in Norway. 1917 Start of the Russian Revolution and Civil War. 1918 First All Russian Congress of Anarcho-syndicalists (August), second Congress held in November/December. 1919 Founding of the FACB in Bulgaria. 1919 IWW founded in Chile. 1919 Regional Workers Federation launched by anarcho-syndicalists in Peru (July). 1921 Kronstadt uprising against the Bolsheviks (1-18 March). 1922 First Congress of the revolutionary syndicalist International Workers Association, Berlin (December). 1923 First Congress of the NSV in the Netherlands. 1923 Mass murder and suppression of anarchists and anarcho-syndicalists in Bulgaria. 1923 Anarcho-syndicalists found the Regional Indian Workers Federation in Peru. 1923 Anarcho-syndicalists help launch the Union Obrera Venezolana. 1925 II Congress of the IWA, Amsterdam. 1928 Anarcho-syndicalists form the ACA in Poland, later changing its name to the ZZZ in 1931. 1931 CGT organised by anarchists in Chile. 1931 IV Congress of the IWA, Madrid. 1934 Mass uprising of the miners in Asturias. 1935 V Congress of the IWA, Paris. 1936 Start of the Spanish Revolution and Civil War (July). 1937 Communist counter revolution in Barcelona, mass killing of CNT's and other militants (May). 1937 Extraordinaire Congress of the IWA, Paris. 1938 VI Congress of the IWA, Paris. 1938 Mass trials of FAUD militants in Germany. 1939 Start of the mass murder of anarchist and anarcho-syndicalist revolutionaries by the Spanish state. 1940 All syndicalist organisations and unions outlawed in Nazi occupied Europe. 1945 Liquidation of syndicalist militants in Eastern Europe by the Soviet Army begins. 1948 Mass arrest and destruction of the Bulgarian anarchist and anarcho­syndicalist movement. 1950 SWF founded in Britain. 1951 VII Congress of the IWA, Toulouse (May). 1952 COB founded in Bolivia. 1953 Workers uprising in East Germany (June). 1956 IX Congress of the IWA, Marseilles. 1956 Hungarian Workers Revolution (October-November). 1958 X Congress of the IWA, Toulouse (August). 1961 XI Congress of the IWA, Bordeaux (September). 1963 XII Congress of the IWA, Paris. 1967 XIII Congress of the IWA, Bordeaux. 1971 Uprising of workers in Gdansk, Poland. 1971 XIV Congress of the IWA, Montpellier, France. 1976 Reappearance in Spain of the CNT as a trade union. 1976 XV Congress of the IWA, Paris. 1976 FAU re-launched in West Germany. 1979 XVI Congress of the IWA, Paris. 1979 DAM founded in Britain. 1980 `Gdansk Accords' drawn up. Foundation of Solidarnosc. 1983 First congress of the reactivated USI in Italy. 1984 XVII Congress of the IWA, Madrid. International Workers Association: Secretariat c/Magdalena 29, Madrid, Spain. International Workers Association: Northern Sub-secretariat Boks 1977, Vika, Oslo, Norway. Postlagerkarte Nr.092822 A, 5000 Koln 1. 339 Lafayette St., Room 202, New York, NY 1001. All these are mail only addresses. 1. The Direct Action Movement is a working class organisation. 2. Our aim is the creation of a free and classless society. 3. We are fighting to abolish the state, capitalism and wage slavery in all their forms and replace them by self-managed production for need not for profit. 4. In order to bring about the new social order, the workers must take over the means of production and distribution. We are the sworn enemies of those who would take over on behalf of the workers. 5. We believe that the only way for the working class to achieve this is for independent organisation in the workplace and community and federation with others in the same industry and locality, independent of, and opposed to all political parties and trade union bureaucracies. All such workers organisations must be controlled by workers themselves and must unite rather than divide the workers movement. Any and all delegates of such workers organisations must be subject to immediate recall by the workers. 6. We are opposed to all States and State institutions. The working class has no country. The class struggle is worldwide and recognises no artificial boundaries. The armies and police of all States do not exist to protect the workers of those States, they do exist only as the repressive arm of the ruling class. 7. We oppose racism, sexism, militarism and all attitudes and institutions that stand in the way of equality and the right of all people everywhere to control their own lives and the environment. 8. The Direct Action Movement is a federation of groups and individuals who believe in the principles of anarcho-syndicalism; a system where the workers alone control industry and the community without the dictates of politicians, bureaucrats, bosses and so-called experts. I remember when this pamphlet first came out, actually when it was still being written. WSA was barely a year old or just a bit over a year when it was written.Good enough pamphlet, for the most part. Mainly accurate, but I thought the part on the WSA and the IWW and the WSA formation was off. Anyway, those are fond days and lots of excitement in growing the IWA. "...1984 ... for the first time in almost three decades [my emph.] there were delegates from three unions present. The propaganda groups had also grown, CNT-AIT of Spain, CNT of France, USI of Italy, made up the trade union sections, DAM Britain, ASF Sweden, ASO Denmark, NSF Norway, FAU West Germany, CNT Bulgaria in exile, LWG United States, WSM Japan, FORA Argentina and FORVE Venezuela were the propaganda sections. For the IWA this was the first real step forward in a long time, and for many of the Spanish comrades of the CNT it made them realise that they were not alone in the struggle to achieve the ideas of anarcho-syndicalism." Anarcho-syndicalism of the mid-to-late 1970s and 1980s was to the global anarchist movement the clearest organized expression of class struggle anarchist-communism at that time. I really think the choice to include certain things in the chronology is rather unclear. it is hugely problematic to have the foundation of Soldarity on there; by 1985, illusions about this should have been long dispelled. The only group relevant to the IWA in Poland prior to the establishment of a section here was ZZZ (formerly ACA), and, by extension, the wartime ZSP. It would really helpful if someone did this for the current IWA (or does one already exist?). i don't know if one exists, but there's a report back from a recent IWA conference which gives some flavour of some of the (European) sections and what they're up to.